As part of the ongoing commitment to improve customer satisfaction and consistency through its digital channels, Delta will introduce improvements to its in-flight Wi-Fi service portal on the first 50 aircraft today. By the week of Feb. 16, the updated designs are expected to be on half of Delta’s Wi-Fi equipped fleet with full rollout completed during the week of Feb. 23. The updates will make it easier for customers to find the most popular features. Customers flying on selected Boeing 737-800, MD-88/90, CRJ-900, ERJ-170 and Airbus A330 aircraft will notice that new Wi-Fi portal reflects design elements of other recently updated Delta digital channels like the design changes to the Fly Delta app, airport self-service check-in kiosks and gate information display screens which were updated in 2014. Connect is the default home page of the portal where customers can select Wi-Fi passes for purchase of internet access, create a Gogo account or sign-in to access their existing passes. 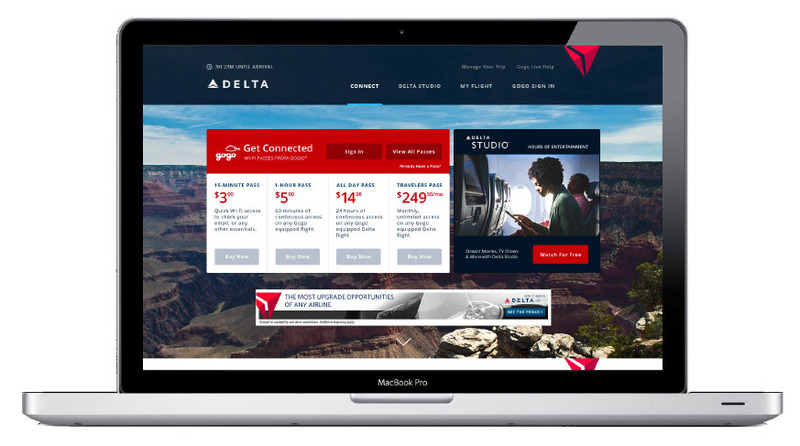 This section also allows passengers to access delta.com for free and provides convenient links to flight booking tools, flight status and SkyMiles information. The Delta Studio section offers free and paid streaming entertainment options for use on customers’ portable electronic devices. Movies and TV shows offered through the service are listed in this section so that customers can select their entertainment choices. A new movie and TV show menu structure has been developed for easier browsing. My Flight is a new section which presents passengers with a real-time flight tracker, details of their flight, their flight path and aircraft information. This section also offers free, quick links to hotel and car rental shopping on delta.com.